Swansea is a coastal city in the south of Wales. With its many spectacular beaches like Oxwich Bay, named the most beautiful beach in Britain by experienced travel writers who visited over a thousand around the world, and celebration of nature in places like Plantasia which has three climate zones featuring monkeys, reptiles, fish, a butterfly house and an array of plant life including a number of species now extinct in the wild. Add to this a host of activities that allow surfing, sailing, water skiing and lots more, a diverse nightlife with casinos, restaurants, pubs and bars, and Swansea is a city that is a must see for people from all walks of life. Hire Hummer Limo offers an extraordinary selection of limousines for hire with a professional yet enthusiastic service like no other. In compliance with the VOSA laws, Hire Hummer Limo has a fleet of vehicles that have been safety-checked and approved for the roads of the United Kingdom. All of our limos for hire are in top quality and in excellent condition, so safety and security should not be a worry for our clients. Our team of staff has been carefully chosen so that the Hire Hummer Limo service is the best it can be. With a team of well dressed, well-mannered and certified chauffeurs waiting to take you on a very special journey, all our clients have to do is sit back and enjoy the ride. We know you will! 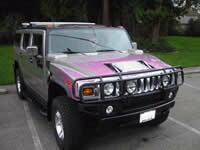 The Hire Hummer Limo fleet has a range of limousines for hire that can really blow you off your feet. These vehicles come with such interior features as a fully equipped entertainment system consisting of flat screen TV sets either LCD or HD, CD and DVD players, Ipod accessible ports and of course a massive sound system. The Hire Hummer Limo fleet likes to keep passengers entertained, and atmosphere is also essential. That is why our limousines for hire have numerous lighting options, drinks bar, spacious interior decorated with luxurious leather and much more. Although Hire Hummer Limo specialises in Hummer limousines for hire, there are also plenty of other stretched limos in our fleet. Some of these limos for hire include the Porsche Cayenne limo hire, Jeep Expedition limo hire, 4x4 BMW X5 limo hire and the Ford Excursion limo hire. These Hummer style limousines come with the latest gadgets plus a few signature features. Hire-Hummer-Limo.co.uk has plenty of information on each vehicle, plus the details on the exterior and interiors of every limo for hire. Please feel free to explore the site, where you will find the full fleet of limousines at our disposal and lots more.